In Lexington, we like to refer to Town Branch Commons (aka Town Branch Trail) as a strip of Bluegrass running through downtown into the rural community. In fact, it’s much more. It’s a strip of history; of waterfront; of walking and cycling trail; and of economic potential. It’s a game changer for generations to come. 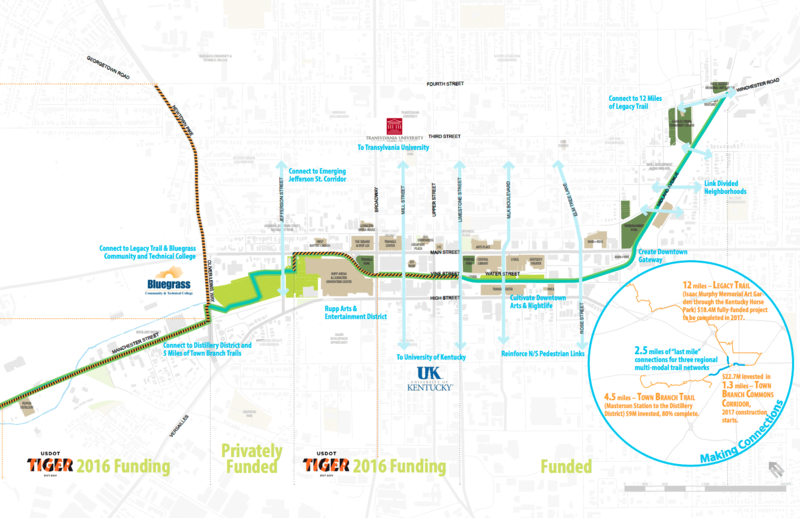 The 2016 TIGER funding offers the opportunity to complete this transformational corridor. First the basics: Town Branch Commons Corridor is a 2.5 mile multi-modal path and park system that will wind through downtown Lexington, following the path of historic Town Branch Creek. It is being funded and built through a public-private partnership (P3). Through its unique design and stormwater management systems, this project will create an environmentally friendly livable, sustainable streetscape. Town Branch Commons Corridor is the final link in an innovative project to connect Lexington’s rural and urban communities. It will connect to two established regional trails—the Legacy Trail and Town Branch Trail, establishing a connection between Lexington’s urban core and the magnificent Bluegrass countryside. Along the way, Town Branch Commons will connect the historic East End, the Isaac Murphy Memorial Art Garden, three higher education campuses, the Downtown Transit Center, Lexington Civic Center, restaurants, entertainment venues, the emerging Distillery District, and the Kentucky Horse Park. The Legacy and Town Branch trails already represent a $24 million investment in local, state and federal funds. Several citizens groups were involved the creating the trails, and their popularity with local citizens and tourists, is rapidly growing. Town Branch Commons will provide an interconnected multi-modal trail system downtown that adds much needed public space and provides a safe alternative to vehicular travel. This entry was posted in News, Status on April 19, 2016 by info. Construction of key sections of both the Town Branch and Legacy trails will begin in 2016 as Lexington works toward connecting its two longest trails to make a continuous 20-mile loop from horse country through downtown and back to its rural landscape. City officials say the remaining two-mile section of the Legacy Trail from Jefferson Street to the Isaac Murphy Memorial Art Garden will begin construction this summer, which will complete the nearly 12-mile trail. Construction will begin on a four-mile section of Town Branch Trail from Alexandria Drive to Manchester Street and Forbes Road in 2016, city officials said last week. Those six miles of trails will be the most trail miles the city has constructed in the past six years. The four-mile stretch of Town Branch will be built in three sections and cost a little less than $6.5 million, which will be paid for through state-federal funding. The two-mile segment of the Legacy Trail section will cost $3.7 million. It too will be paid for with state-federal transportation funds. It’s taken more than a decade for Lexington to get its now-popular trail system off the ground as acquisition of land, the complexities of building trails through downtown, and a lack of funding have forced the two trails to be completed in sections. Town Branch Trail’s first half-mile paved stretch for walking and biking, which starts near Masterson Station on the city’s northwest side, opened in fall 2005. An 8.5-mile portion of the Legacy Trail — from the North Loudon YMCA to near the Kentucky Horse Park— opened in September 2010. That project was completed in anticipation of the 2010 Alltech World Equestrian Games. Federal stimulus and other funding helped the city develop and build the 8.5-mile section. THE VERY FIRST MEETING WE HAD PEOPLE WHO THOUGHT THESE TRAILS WERE GOING TO BE A ROUTE FOR TERRORISTS … . THEY THOUGHT THESE PATHS ARE ONLY GOING TO BE USED BY CRIMINALS. NOW, THE WHOLE MIND-SET HAS SHIFTED. -Van Meter Pettit, president of Town Branch Trail Inc.
Over the years, the city has added additional miles to both trails as funding trickled in. Van Meter Pettit, president of Town Branch Trail Inc., said that when the idea of a continuous trail system was first discussed more than a decade ago, Lexington residents were suspicious. The city knew the trails were popular but now has numbers to prove it. In September, new electronic counters on the Legacy Trail clocked 13,509 trips by bicyclists. Lovan said the development of the trail system has been slow because Lexington is creating a 20-mile trail loop through some land it doesn’t own and must navigate creeks, railroads, utilities and state highways. Many cities have converted former railroad lines to trails, which is much easier. Town Branch Trail goes through one of the oldest commercial corridors in Kentucky. In September 2014, then-Gov. Steve Beshear announced $6.5 million in state-federal funding for a nearly four-mile stretch of Town Branch Trail. Town Branch Trail is now complete from Masterson Station to Alexandria Drive. That $6.5 million will be used to build the next three phases of the trail. Construction probably will begin on the next section — phase 3, from Alexandria Drive to Bizzel Drive — in the spring, said Lovan. The fourth phase, a very short section, will cost $1.01 million. It will pass under a bridge that the Kentucky Transportation Cabinet rebuilt as part of the New Circle Road widening project. “That has already been completed,” Lovan said of the bridge. Another key portion of Town Branch Trail will include a rebuilt intersection into McConnell Springs on Old Frankfort Pike. Because that’s a state road, the city has to work with the Transportation Cabinet to redo that intersection, which the city hopes will include a traffic light. THE CITY HAS AN ENGINEERING REPORT ON THE FINAL SEGMENT OF TOWN BRANCH TRAIL (FROM FORBES ROAD TO OLIVER LEWIS WAY) THAT SHOWS COSTS FOR THAT PORTION OF THE TRAIL PROBABLY WILL BE $13 MILLION TO $15 MILLION. That pedestrian-friendly intersection into McConnell Springs will be a boon not only for trail users but for the park, Pettit said. McConnell Springs is tucked behind heavy industry on Old Frankfort Pike. To get there, people have to drive. Once that intersection and that key connector are finished, more people will find their way to McConnell Springs. “If they are connected to greenways, the use of these parks goes way up,” Pettit said. The three sections will be constructed at the same time, Lovan said. That way if a hiccup occurs, one problem won’t bring construction of the entire trail to a standstill, he said. Lovan said he hoped the four-mile section would be completed in 2017. But because construction involves so many moving parts, a completion date is difficult to predict, Pettit said. At the same time construction continues on the Town Branch, the city will be seeking funding for the final segment of the trail from Forbes Road to Oliver Lewis Way. The city has an engineering report that shows costs for that portion of the trail probably will be $13 million to $15 million. Lovan said the city would be going after city-federal transportation grants and any other type of funding to get that key section of the trail — which includes the Distillery District on Manchester — funded. City officials have said they hope construction on the downtown portion of the Town Branch Trail, the Town Branch Commons, also will begin in 2016. Although Town Branch Commons is funded differently from the Town Branch Trail, it is part of the eight-mile Town Branch trail system. Mayor Jim Gray has pushed for its funding and construction for the past several years. The city set aside $10 million in bond money for the project in this year’s budget. In addition, Beshear pledged nearly $6 million in state-federal transportation money for the Commons, which will include not only a trail but a series of pocket parks when completed. In addition, the city has applied for a $5.6 million low-interest state loan. When completed, Town Branch Commons will stretch from the Isaac Murphy Art Garden — a trail head for the Legacy Trail —to Oliver Lewis Way — the beginning of the Town Branch trail’s rural section. With the state money, construction on a section of the Commons will begin along Midland Avenue in 2016, city officials have said. In addition to state and federal money, the city hopes to raise more than $50 million in private money to build the pocket parks along the Commons and to pay for other amenities. The two-mile remaining section of the Legacy Trail from Jefferson to Fourth streets will mean moving the trail onto city streets. That also will mean the loss of some on-street parking. The city held public meetings to inform people who live in the area of the trail, but those meetings were not well attended, Lovan said. He said the city is going to follow up with letters to affected residents to ensure people know about possible changes and the loss of parking to make room for the trail on Fourth Street. Transylvania University received a grant from the state to cover portions of the trail that goes on its property. Transylvania also is providing a match for that funding, Lovan said. “We will have markers on the street and we’re going to be painting the bike lanes green,” Lovan said. “It will impact people mostly on Fourth and Third streets. In addition, the state — which owns the Kentucky Horse Park — is in the process of building an additional 1.8-mile section of the trail from the park. Currently the trail ends at the Fayette County line, Lovan said. Once completed, people will be able to travel from Masterson Station through downtown to the horse park on foot or by bicycle, Pettit said. This entry was posted in News, Status on December 20, 2015 by info. Building and maintaining a linear park through downtown Lexington could cost upwards of $75 million, city officials told the Urban County Council on Tuesday. But only $10 million would be city money, they said. Town Branch Commons, a 2.5-mile linear park with a network of pools, fountains, rain gardens and pocket parks stretching from Isaac Murphy Memorial Art Garden to Cox Street would be funded through a combination of private, local and federal money, said Jeff Fugate, president and COO of the Lexington Downtown Development Authority, which has spearheaded efforts to create the park since 2013. That $75 million includes a little more than $24 million for infrastructure. A tentative target of $30 million has been set to establish parks along the path of Town Branch, the stream that runs mostly under downtown but would be raised to the surface. About $8 million would be needed to operate the system for 10 years after it is completed. An additional $12 million is for an operating endowment, which would generate $500,000 to $1 million a year for operating expenses beyond the first 10 years. It would be maintained by a nonprofit organization. It’s an ambitious plan, Mayor Jim Gray said in an interview last week. But Town Branch Commons could transform the city for generations, he said. Plans for Town Branch Commons were unveiled in 2013 but were put on hold while the city pursued a major overhaul of Rupp Arena and the attached convention center. With Rupp Arena plans stalled, the city is turning its focus to Town Branch Commons. The city has completed a pre-application for more than $13 million in federal transportation grant funding. The final application is due June 3. Gray has set aside $10 million in his proposed budget for the fiscal year that begins July 1. Lextran has agreed to put in a little less than $1 million. The council agreed by voice vote during Tuesday’s meeting to ask the city’s law department to prepare a resolution supporting the application for the federal transportation grant. The first $24 million would go toward building infrastructure, which would include bike lanes and trails that would connect downtown to the Legacy and Town Branch trails, said Jamie Emmons, Gray’s chief of staff. “The second phase of funding would be privately funded,” Emmons said. Fugate said an ad hoc committee had been meeting to work on details. The Bluegrass Community Development Foundation has agreed to help with fund raising, Fugate said. The design from Scape/Landscape Architecture of New York calls for a large Central Park-like park on the Cox Street lot west of Rupp Arena, a linear park in the Vine Street parking lot behind city hall, and other improvements to existing parks along the trail, including Triangle and Thoroughbred parks. This entry was posted in News, Status on May 15, 2015 by info. Plans for the Town Branch Commons, a long linear park with a network of pools, fountains, rain gardens and pocket parks stretching from Isaac Murphy Memorial Art Garden to Cox Street, were unveiled in 2013 but were placed on hold while the city pursued a major overhaul of Rupp Arena and the attached convention center. But with Rupp Arena plans stalled, the city is now turning its focus to Town Branch Commons. The row of asphalt parking lots behind the city’s government center and the Kentucky Theater along Vine Street provides parking but little else. In 100 years, no one will remember it, said Jeff Fugate, president of the Downtown Development Authority. Under plans for the Town Branch Commons, those asphalt lots could turn into green space with a water feature, benches and trees. “Parks are long-term investments that shape investments for the next century,” Fugate said Friday. Plans for the Town Branch Commons, a long linear park with a network of pools, fountains, rain gardens and pocket parks stretching from Isaac Murphy Memorial Art Garden to Cox Street, were unveiled in 2013 but were placed on hold while the city pursued a major overhaul of Rupp Arena and the attached convention center. Part of the proposal includes a large Central Park-like green space next to Rupp Arena. The linear Town Branch Commons project includes four sections. One of the proposed larger green spaces in the downtown linear park includes a park behind the Kentucky Theatre and the Urban County Government Center. That area is currently a series of asphalt parking lots. With Rupp Arena plans stalled, the city is now turning its focus to Town Branch Commons. The proposed park follows the path of Town Branch, a creek buried underground through downtown. Mayor Jim Gray said in his State of the City speech last week that he would include money in his proposed budget in April for the project. Gray said in an interview Friday that the city is still looking at a design by the firm Scape/Landscape Architecture to determine what portion of the park could be started first. The city is also still working on cost estimates. Scape, which was selected from five finalists in a design contest, has separated the plans into four sections that could be developed over time. “We are still trying to determine what that first phase will be and are still in the process of doing cost analysis,” Gray said. But Gray said private funding will be part of the overall Town Branch Commons financing plan. The Downtown Development Authority is taking the lead in developing the park. Fugate said many cities of similar size to Lexington are investing in parks because those green spaces create a unique sense of place. Across the country, nearly every new park that has been built has been built with a combination of private and public funds, he said. Lexington doesn’t have to go far to find a model for a park system that works. 21st Century Parks, a Louisville nonprofit, has used a combination of private and public funding to plan and develop The Parklands, a series of four interconnected parks along Floyd Fork in Louisville. Two of the parks are already open, and the last two parks will likely open in 2016, said Dan Jones, the chairman and chief executive officer of 21st Century Parks. Jones and 21st Century Parks are advisors on the Town Branch Commons project. The Louisville nonprofit started with a master plan in 2006 and will be finished with its interconnected park system by 2016. In that time, the group raised more than $70 million in private funding and more than $52 million from federal, state and local governments. Jones said funding for parks was not a hard sell in a town that has benefitted so much from parks first conceived more than a century ago. When world-renowned landscape architect Frederick Law Olmsted designed three parks — Cherokee, Iroquois and Shawnee — in the late 1890s, the parks were mostly on the outskirts of town. Now, Louisville has grown around those parks. Some of the most desirable neighborhoods in Louisville are close to those parks because people want to live next to green space. For Louisville, the Olmsted parks have raised property values and created a specific sense of place. Funding Town Branch Commons will be a key hurdle, Jones said. Not only does the city need a plan to raise money for the park, but it will also have to think about how to support the park over time. The good news: There is precedent for private investment in Lexington’s parks. The Triangle Foundation, a nonprofit of local and civic business leaders, was started in 1980 by local businessman Alex Campbell Jr. and other community leaders to build Triangle Park in the middle of downtown. The group has also paid for Thoroughbred Park on Midland Avenue and Main Street and the skatepark at Woodland Park. Gray said he and the Triangle Foundation leaders have had some initial conversations about how the foundation might help with the development of Town Branch Commons. “It’s a tribute to his leadership and vision that we have urban parks at all,” Gray said of Campbell. Stephen Grossman, president of the Triangle Foundation, said the foundation has had some initial discussions with the city about how the group could help with the overall vision. But those discussions are still preliminary. “I would like to see it come together,” Grossman said of the overall plan. Fugate said that when completed the linear park would not only create a green space going through the city’s core but would also connect the city’s two main trails — the Legacy Trail and the Town Branch Trail. The plans also include a large park adjacent to Rupp Arena. The idea of creating a linear park through downtown has been kicked around for some time. But through Scape’s plans, the city finally has a way forward, Fugate said. There is a lot to do in coming months. Gray will unveil his budget proposal to the Urban County Council sometime in April. The council has until July 1 to approve the budget. Many council members said after Gray’s speech last week that they supported the idea of the park but wanted to know more about the details. This entry was posted in News, Status on January 21, 2015 by info. Phase I, the first mile and a half of the trail, is now completed. Phase II, the second phase, has been bid and is currently under construction. Phase III of the trail, the next one mile section, has been funded, and has been sent out for bid for design. We look to see construction begin in 2009. Phase IV and V are in the stage of feasibility study and conceptual design. See our latest map for how Phase V will dovetail with the Manchester Street Distillery District. For a closer look, go to McConnell’s Trace at Long Branch Rd. to see our first mile in place. This entry was posted in Status on October 1, 2008 by info.